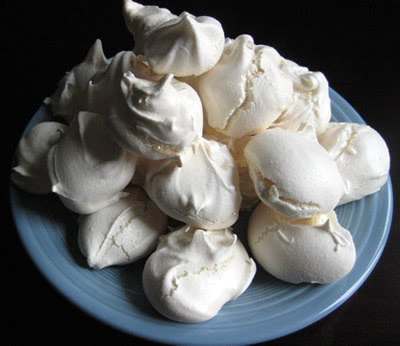 Suspiros, more commonly known as meringues, are a staple treat on the LBUH’s side of the family. Family lore provides two alternative theories as to how they became part of the family tradition. One version has it that when the LBUH’s mother used to make Buche De Noel for the Christmas holidays, she garnished the log with little mushrooms made out of beaten egg-white batter. The petite champignons turned out to be a real crowd pleaser, and far more so than the intricate and labor-intensive cake. Over time the decadent and time-consuming log got the boot, but the Suspiros landed a recurring role at the holiday table. The other story is that these treats were introduced to the Stateside folks by the LBUH’s family in Colombia. Given the fact that they all call these tasty treats Suspiros (Spanish for “Sighs”), and not meringues, the LBUH’s guess is that story #2 holds more weight. As, however, my mother-in-law espouses the version of events recounted in story #1, I’m going with that theory, and I don’t care what kind of fancypants linguistic forensics you throw at me. Beat egg whites and vanilla extract until the whites is beginning to stiffen and form tiny peaks. Once the egg white/vanilla mixture is stiffening, slowly add the sugar and continue to beat until the sugar is dissolved and the mixture is not grainy. Cover a baking sheet with a silpat mat or parchment paper*** and place spoonfuls of the batter onto the mat or paper**** . Place the sheet in the oven and cook for 4-5 hours at 225 degrees. ***** When the suspiros are done, they will be firm, crunchy, and crumbly. If the centers are still chewy, bake for another 20-30 minutes. Dust with coco powder or powdered sugar for extra presentation "WOW!" if you'd like. **Depending on what you keep in your kitchen, this treat could be whipped up without ever leaving the house. We had to buy eggs, but had plenty of sugar and vanilla extract on hand. * **Make sure you are using parchment paper and not wax paper. Wax + heat = mess you don’t want to clean. **** If you want to make really fancy ones, you can use an HUH? *****Basically we’re turning the oven into a kiln. We’re not baking the Suspiros as much as drying them out, ensuring that the egg whites are fully cooked and stay at the necessary 140 degrees for at least 3 minutes. Let’s try and avoid Salmonella, shall we? Because apparently we can’t trust food companies to do it for us! Gorgeous pictures, as usual! I make a version of these for Passover every year where I bake for less time and let the middles be chewy and marshmallowy. Very Gaudi-looking. I buy the Spanish story! Whatever the origins, there's no debate that these are awesome! I'm looking forward to trying them out. Funny, they have them in Portugal and they go exactly by the same name. Sometimes they mix the egg whites with other flavourings too such as cinnamon, strawberry essence or vanilla essence and even cocoa. My mother made these every Christmas with crushed peppermint sticks. Very yummy! Terrific photos and I like the nutritional info...very professional post. Well done! I've made these as well. Love some of your photographic shots. Nice work. Adding a little vinegar (approx 1 tsp) will turn these into crispy little meringues with a chewy center...totally inspired! I love the originas of the cookies - and your photos are so pretty. 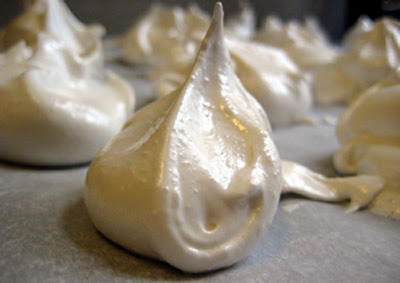 When making Christmas confections, I would make meringues with leftovers. But they were not as luscious as these! They look like little edible clouds of deliciousness! So does the below.....My mom use to make that dish. These look absolutely delectable. We have a Philippine version - same ingredients, same preparation - that we call merengue (pronounced meh-reng-gay)! Sighs is such a poetic name. 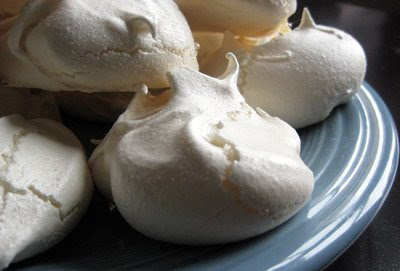 Anyway, I'll eat meringues whatever they are called. Can you use a sugar substitute like splenda? I LOVE meringues and they always seems like a lot of work to make - but these look easy and wonderful as well as economical (since I just bought a tub of them at Trader Joe's for three times the amount you spent making them!). We're not really fans of artificial sweeteners around here. I don't have any experience baking with Splenda, so unfortunately can't really opine on whether these would turn out or not. My suspicion, though, is that it would not work, as a meringue is created basically through a chemical interaction between the sugar and the egg whites when exposed to heat. If you try it, I would guess that you'd have the best results if you did a mix of real sugar and the sweetener, and not just all Splenda. Let us know how it works out! I remember eating some store-bought meringues at my friend's house when I was younger, and I fell in love with the melt-in-your-mouth crunchy treats almost instantly. It had to have been one of the oddest snacks I'd ever eaten, and I've yet to have another one to this day. Do you think adding food coloring to these would affect the chemical interaction that makes these? this is perfect for my Panama project. Senora Fernandez is gonna love me. I am so glad I found your recipe. Others I have seen call for cream of tartar--which I am out of. My mama always made these at the end of holiday baking sessions. Put in the oven that is already hot @ 350 then turn it off and leave overnight. She called them "Bake while you sleep" cookies. We've added cocoa, food coloring, chocolate chips, chopped nuts--just not all at the same time. :D So yummy! I just made these and plan on using them for Eton Mess, but I ate one alone and it was great. I didn't beat the egg whites and sugar until all the sugar dissolved because it was taking quite a long time. That probably accounts for why some of the sugar in the meringues turned into caramel in the oven. But the caramel doesn't really affect the taste or texture all that much.